Lebanese singer Sandy Chamoun performs with her band at an arts festival in the Shatila refguee camp. Photo: UNDP Lebanon. “Even though she is in pain, she’s still dancing!” Ma’ammar El Jasem says, standing proudly next to his creation: a ballerina wrapped in metal wires. At such a young age, the 13-year-old Syrian sculptor may not be fully aware that he’s representing the power of survival. 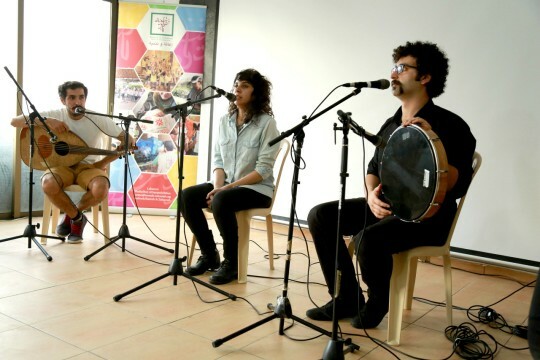 Along with other artists of different ages and nationalities, Ma’amar is taking part in a three-day cultural festival organized by the NGO Basmeh and Zeitooneh, on the occasion of the first anniversary of its Art and Culture Centre in the Shatila refugee camp. The Peace Building in Lebanon project aims to reinforce stability and social cohesion by addressing the root causes of conflict. Youth, educators, journalists and local leaders from 45 municipalities participate in efforts to strengthen peace building and crisis management. The project has distributed 350,000 copies of a news supplement addressing controversial topics in balanced and culturally sensitive terms. 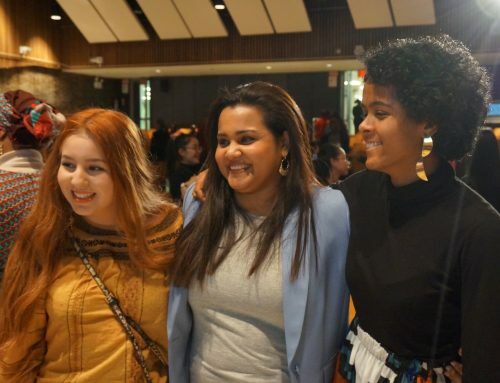 2,300 students, teachers and parents benefit from an initiative to ensure violence-free schools. The festival, “Shatila: The Meeting Point”, was organized with the support of the UNDP Peace Building in Lebanon project, which aims to reinforce stability and social cohesion by addressing the root causes of conflict. It creates safe spaces for different identity groups to come together to openly discuss their concerns and foster mutual understanding. The Shatila refugee camp was established in 1949 to house about 3,000 Palestinian refugees in southern Beirut. It’s now home to about 10,000 Palestinians. With displaced families arriving from the conflict in neighbouring Syria, the camp’s population has swelled to as many as 22,000. Walking in the streets of the camp, the sound of folkloric Arabic music is heard wafting down from the fourth floor where the arts centre pounds with life amid the difficult conditions in the camp. The festivities last for three busy days, inviting visitors from all over Beirut to tour paintings by Lebanese, Palestinian and Syrian artists. Dabkeh shows by the Lebanese-Palestinian dance groups Ajras El Awde and Ahlam Laji’ move all three nationalities to one pure groove. Basmeh and Zeitooneh’s choir, made up of 13 young Syrian singers, performs a repertoire of classic and original Arabic songs, followed by Tarek Said on Buzuk and a screening of short films. With funding from the European Union, Germany, Japan, Norway and the UK, the Peace Building in Lebanon project engages youth, educators, media, civil society and local government in peace building and crisis management. Some 45 municipalities and 135 local authorities participate in mechanisms to enhance social stability, while 2,300 students, teachers and parents benefit from an initiative to ensure violence-free school. Thirty-four media outlets and 85 journalists have committed to promote tolerance and rational public discourse. A news supplement addressing controversial topics in balanced and culturally sensitive terms is published in three languages. At the cultural festival in Shatila, Lebanese artist Roy Dib, Syrian playwright Mohamad Al-Attar and Palestinian editor Anis Mohsen animate a debate on “Funding culture in time of distress.” Participants discuss the effect of the on-going conflict on Syria’s artists, writers, musicians and performers. Audience members reflect on the opportunities and challenges for the preservation and growth of Syria’s culture and heritage. “I think it’s a very constructive initiative to host different talents and to invite everyone to be more engaged to do good for the community through an arts space promoting dialogue, understanding and accepting the other,” says Luca Renda, UNDP Country Director in Lebanon. Just as the festival began with musical celebrations, it ends with a concert by Asa’aleek, an active Syrian band in Beirut, as well as a performance by the multinational Furn El Shabab pop band. “Shatila: The Meeting Point” is also an opportunity for Basmeh and Zeitooneh to inaugurate its new library – the first of its kind in Shatila – and open its doors to visitors who will have access to books and computers, free of charge and open to all members of the public.